A revolution in lighting has begun: High output, environmentally sound white LEDs (light emitting diodes) are 20% more efficient than compact fluorescents—and last four –six times as long. Because LEDs have a hemispherical light distribution, LED downlights have almost almost twice the efficacy of comparable compact fluorescent downlights. Light Kinetics represents Gallium Lighting of the USA. Gallium is dedicated to leading the way into the new era in lighting technology. 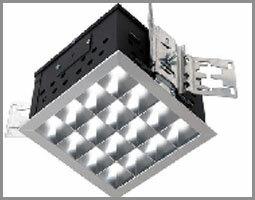 Gallium’s state-of-the-art, specification-grade LED lighting systems produce a brilliant white light. Featuring optical systems designed especially for illuminating general architectural spaces, Gallium LED lighting systems make a distinctive statement while providing unprecedented energy efficiency.